If a double wire harness strap is installed onto the wire harness assembly and steering column, the original holder for the wire strap(s) MUST be reused during installation. Remove the wire harness strap(s) where necessary. The new SIR coil assembly will be centered. Improper alignment of the SIR coil assembly may damage the unit, causing an inflatable restraint malfunction. 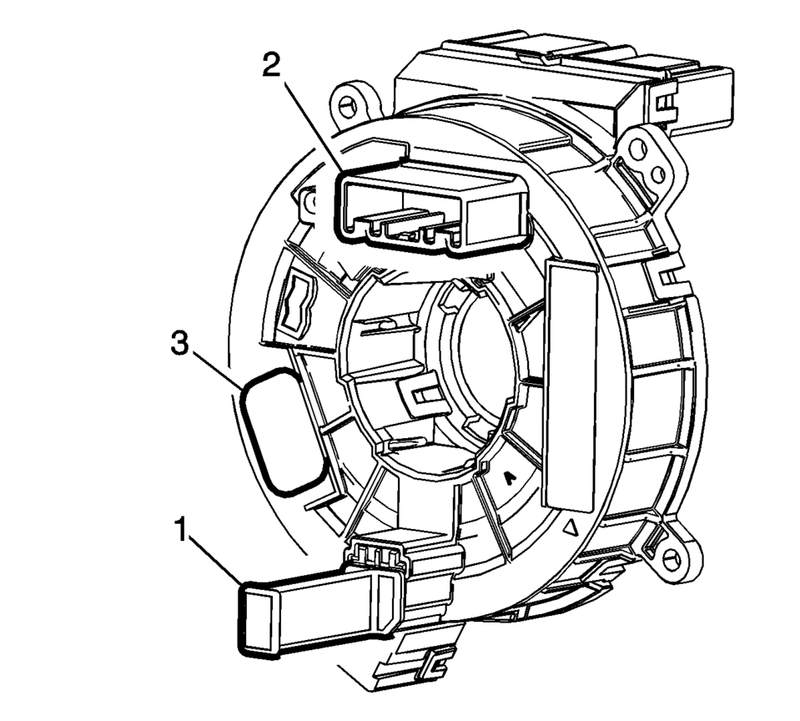 Inspect the inflatable restraint steering wheel module coil. If the yellow lock pin?€‰(1)?€‰is present, the uplead post?€‰(2)?€‰is at the 12:00 position and the loop (u-turn) appears in the centering window?€‰(3)?€‰then the coil is already in the centered position and no further action is required. The wheels on the vehicle are straight ahead. 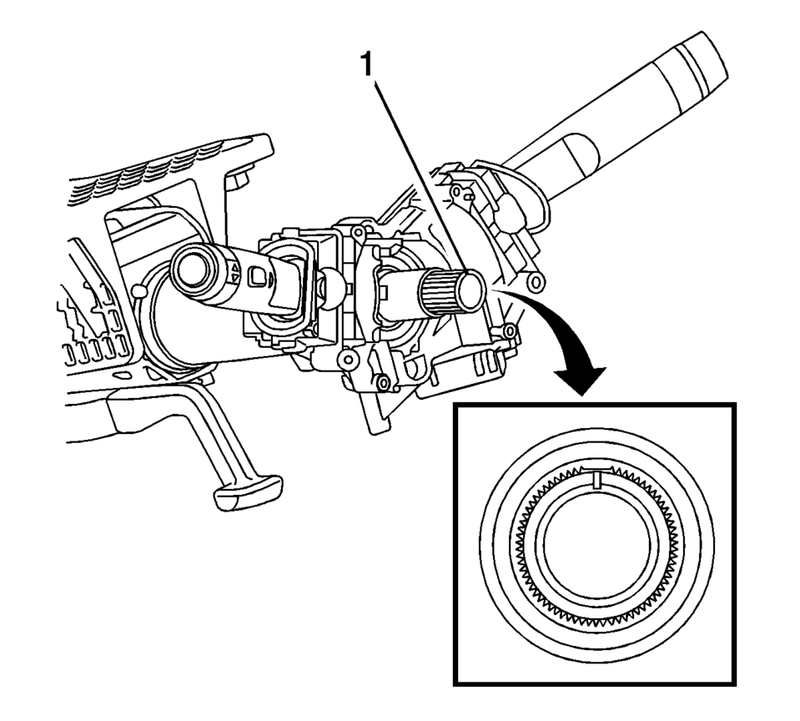 The block tooth?€‰(1)?€‰on the steering shaft is in the?€‰12?€‰o'clock position. The ignition switch is in the LOCK position. Hold the coil with the face up. Slowly rotate the coil hub clockwise until the coil ribbon stops. Slowly rotate the coil hub counterclockwise approximately?€‰2.5?€‰turns until the uplead post (2) is at the?€‰12:00?€‰position. View the centering window?€‰(3)?€‰and ensure the loop (u-turn) is visible. If the loop is visible then the coil is in the CENTER position. While holding the coil hub in the CENTER position, align the coil with the steering column components and slide onto the steering shaft. If a double wire harness strap is installed onto the wire harness assembly and steering column, the wires must be routed up against the column. One wire harness strap will surround one lead from the coil to the steering column. The other wire harness strap will surround all other leads to the steering column.